Jack Furst loves South Pole, Alaska, almost as much as his sled dogs and second only to his girlfriend, Joyce. But the area has taken a downturn in recent years, and he’s afraid it’ll be a ghost town before long. Joyce Nicholson enjoys her home base in South Pole and flies her single-engine plane to surrounding villages with supplies daily. When her company pressures her to move to another city with a better location and bigger population, Joyce fears leaving Jack behind. There’s nothing more powerful than Christmas in Alaska, and when a surprise mayoral election shocks the entire South Pole residency, the town flips upside down and holds the most unusual Christmas celebration ever. Will it be enough to save the beloved city? This was a very quick Christmas listen and was very different from anything else I have read. I loved the unique and different take on Christmas that Brooke creates in this story that takes place in South Pole Alaska. Usually with short stories I feel they are lacking but this one I didn't get that feeling. She made me feel like I was right there with Jack and Joy and enjoying Christmas with them. I can't wait to read the rest of the books that take place in South Pole. The narrator (Brooke) really made her story come alive for me. South Pole, Alaska, is dying a slow death. Can a new mayor revive the town? Will Jack Furst be able to be with his love, Joyce, a bush pilot who drops in on the town? Or, will the town dry up and will Joyce be reassigned to other areas because of it? A fun, sweet holiday read, wonderfully written and narrated by the author. Just the right length for a short drive while you go Christmas shopping! I received a copy of this audiobook from Audiobook Boom! and chose to review it. I'm now looking FORWARD to Christmas! a Christmas story that will touch your heart. it is inspired by the true meaning of Christmas. Jack Furst lived in South Pole Alaska, a small sleepy town that was steadily loosing its population to larger surrounding cities. Jack trained dogs, and has this weird habit of standing on his head. ( it gave him a different view of the world)! Jack was not interested in leaving South Pole. His girlfriend, Joyce, was a pilot who flew supplies to the smaller communities. At a town meeting, they were informed that the Mayor was leaving to take a job elsewhere. Joyce secretly floats Jacks name , and a flabbergasted Jack is elected. Jack is disturbed because the town was slowly dying with so many people leaving. He has to come up with something to save the town. Jack’s solution is unique and to say the least! Treat yourself to this charming book. It will warm your heart! I found this book really fun and I was very disappointed when the story ended. I would like to do these Christmas traditions. I would also like to meet all the characters in the book. Brook did a great job narrating. She was very clear to listen to and the story was easy to follow and picture. A must have holiday read. The new mayor of a dying, Alaska small town comes up with an idea for making Christmas special that puts South Pole on the map . A sweet, feel good Christmas romance that emphasize the giving spirit of Christmas. I love the depiction of small town life in this story. South Pole is a place where everybody knows your name and people will pitch in to help out on a project, even one that's offbeat and a little crazy. I love Jack's easy going charm and the fact that it's Joyce, his girlfriend that has the unconventional job which threatens the couple's happiness in their idyllic small town. This one's a very short read but if you're looking for something light to put you into the Christmas mood this year, this might be exactly the story you're looking for. This is not my normal story but I enjoyed the whimsical holiday novella. A Christmas story full of love, faith, and joyfulness. 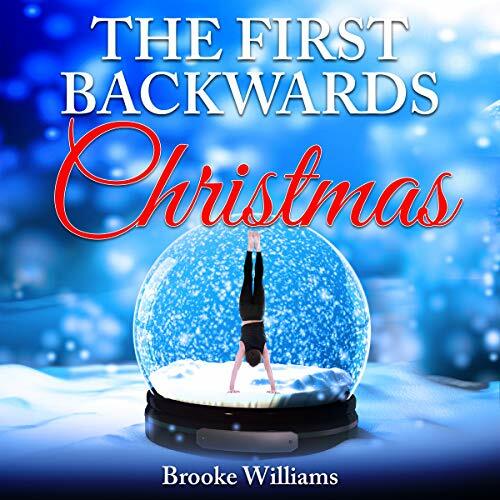 The First Backwards Christmas was a great read by Brooke Williams. Jack First absolutely loves the town of South Pole, Alaska and doesn't want to see it become a ghost town. His girlfriend Joyce is afraid that her job will make her move to a bigger city. I loved reading about the first ever backwards Christmas of the town. A sweet Christmas read about Jack trying to save the town he loves, and Joyce trying to find a reason to keep him there. I voluntarily reviewed a copy of this book. I really enjoyed listening to this. I truly enjoyed this story. I love the idea of the backwards Christmas. I had wondered where the idea came from and now I know. The story of Jack and Joyce is what we all desire to have in a love; someone that is always there for you and has your back. I love how she knew him so well and had such confidence in him that she could convince others to support him as well. a quick story that you can listen to while doing your shopping. I had me laughing in the aisles.